If you like weight & Quality......look no further!! Many customers don't realise that these Tankards exist as most place only supply Pewter, these are much heavier and even a bit cheaper!!! 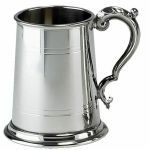 The 'Milk Churn' Style Tankard has proved to be our best selling Tankard and an absolutely beautiful shaped one as well!! 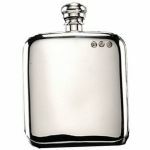 Classic Shape with really Heavyweight Quality.......nothing else to say really!! 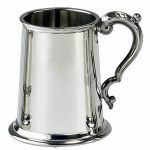 This shape is the Classic English 1 Pint Pewter Tankard, with an ornate Swan Neck Handle and this one has a lined finish. Price shown includes engraving of text and a new logo would add £10 to the price (although this is a one-off price and if used again or using an existing logo, they would be free!). Please call 01865-736028 for more details and logo formats required.